We’d love your help. Let us know what’s wrong with this preview of Rosemary Gladstar's Medicinal Herbs by Rosemary Gladstar. Widely recognized as the godmother of modern herbalism, Rosemary Gladstar is renowned worldwide for her inspired teaching and trustworthy knowledge of healing herbs. 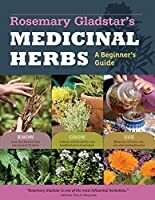 With Medicinal Herbs: A Beginner's Guide, Gladstar offers a fresh introduction for a new generation of gardeners and natural health and self-sufficiency enthusiasts. Thirty-three of the most common and versatil Widely recognized as the godmother of modern herbalism, Rosemary Gladstar is renowned worldwide for her inspired teaching and trustworthy knowledge of healing herbs. 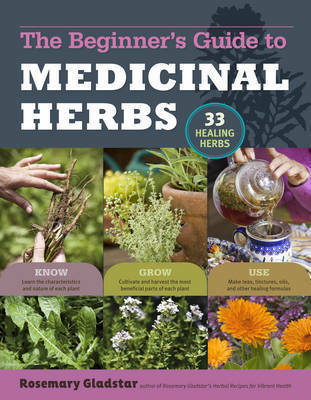 With Medicinal Herbs: A Beginner's Guide, Gladstar offers a fresh introduction for a new generation of gardeners and natural health and self-sufficiency enthusiasts. Thirty-three of the most common and versatile healing plants are profiled in depth to get the budding herbalist off on the right foot. Readers will learn how to grow, harvest, prepare, and use each herb. Step-by-step instructions explain how to prepare herbal teas, salves, syrups, tinctures, oils, and liniments to stock the home medicine chest. To ask other readers questions about Rosemary Gladstar's Medicinal Herbs, please sign up. how can i read this book in your library? This is a nice little introduction to using medicinal herbs. I like how it focuses on a limited number of herbs and gives a pretty thorough description of their properties as well as how to cultivate them. There are also some easy recipes to get started in making tinctures, salves, infusions, and all sorts of other things. It made me want to make stuff. After reading one of Rosemary Gladstar's books, I went looking for others. In this book she provides pictures so you can recognize the plants, explains which parts are useful in which capacity, and even has safety sections. You will find many helpful uses for the spices you use for cooking. An excellent resource. Beautiful book on how to grow and use medicinal herbs. Gorgeous pages all full color! She's simple but knowledgable. She's from my awesome state of Vermont! I got this for a great price on Amazon! A gem! This book offers simple practical instructions for tinctures, various remedies, and insights on commonly used medicinal herbal plants. Many or most of the plants referred to are likely accessible to you in some form regardless of locale. As you turn the pages you feel the vibrance of who Rosemary Gladstar is renown to be. She has created a warm read for the plant lover at heart, someone starting into the practice of herbalism, or the experienced herbalist to use as a reference. 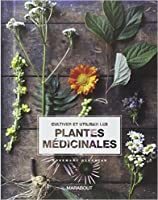 This book will se This book offers simple practical instructions for tinctures, various remedies, and insights on commonly used medicinal herbal plants. Many or most of the plants referred to are likely accessible to you in some form regardless of locale. As you turn the pages you feel the vibrance of who Rosemary Gladstar is renown to be. She has created a warm read for the plant lover at heart, someone starting into the practice of herbalism, or the experienced herbalist to use as a reference. This book will serve my family and I for a lifetime in natural, reliable, back to nature ways to promote health and vitality. Fantastic resource and a book that you will return to time and time again. This is a beginner's guide as stated in the subtitle. So it is neither comprehensive in its list of herbs nor in its list of applications. I do believe that Ms. Gladstar has done an excellent job of explaining the benefits of herbs for health. Also in selecting some of the most readily available herbs, in North America at least, for readers to purchase or grow their own. You will learn the difference between an infusion and a decoction and how to go about making them. Or simply making your own her This is a beginner's guide as stated in the subtitle. So it is neither comprehensive in its list of herbs nor in its list of applications. You will learn the difference between an infusion and a decoction and how to go about making them. Or simply making your own herbal teas and flavorful foods. There is discussion of medicinal oils, syrups, salves and tinctures and what each is good for. You will also learn how to apply remedies by bath, poultice, or compress and considerations for treating children, and chronic or acute problems. That said, you will probably not learn these all on your first read. I read this as a Kindle book and believe that would be the best format to own it in. This is a wonderful beginner's reference and the page links in the table of contents and the great index will help to quickly find what you need when you need it. This was my first book about herbalism and I am pleasantly surprised. For one, the layout is really beautiful and modern, with lots of full color photos, unlike many of the older herbalism books that I looked at at the library. Especially for beginners I think it is very nice to have a book that is not too heavy on the text. The beginning of the book is dedicated to making different herbal medicines, like tinctures, infusions and even herbal pills. The remaining part of the book (about three quar This was my first book about herbalism and I am pleasantly surprised. The beginning of the book is dedicated to making different herbal medicines, like tinctures, infusions and even herbal pills. The remaining part of the book (about three quarters) is dedicated to 33 differents herbs and spices, including a description of their medical properties and some recipes to try at home. Most of these are common herbs one can easily find at the health food store. What I enjoyed very much was that a lot of the recipes contain only 3-5 ingredients. If you are a beginner herbalist you don't want to have to buy ten different herbs just to make one formula. So far I made the Dandelion Burdock Tincture for the liver and I plan on trying the Cayenne Rub next. This is an excellent introductory and/or summary guide for incorporating medicinal herbs into your lifestyle. I appreciate that the author does not discount or disapprove of modern medicine and/or visiting your doctor for greater complications but instead advocates for simple herbal remedies one can try in replacement of over the counter medication for minor problems (headaches, digestive pains, burns and itching) and as preventatives. 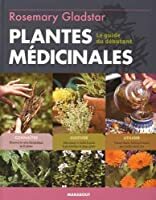 This book is highly accessible to anyone interested in learn This is an excellent introductory and/or summary guide for incorporating medicinal herbs into your lifestyle. I appreciate that the author does not discount or disapprove of modern medicine and/or visiting your doctor for greater complications but instead advocates for simple herbal remedies one can try in replacement of over the counter medication for minor problems (headaches, digestive pains, burns and itching) and as preventatives. This book is highly accessible to anyone interested in learning about medicinal herbs. Way before all of us were bombarded with countless ads for so-called wonder drugs on television, people turned to nature for remedies. Rosemary Gladstar has written a useful guide, “Medicinal Herbs, Learn How to Ease Common Ailments Naturally” which describes how to grow, harvest, prepare and use 33 of the most common healing plants. It is written in an easy to understand style with plenty of pictures. Highly recommended. I spoke with Rosemary Gladstar about her book and that conversation can be Way before all of us were bombarded with countless ads for so-called wonder drugs on television, people turned to nature for remedies. Rosemary Gladstar has written a useful guide, “Medicinal Herbs, Learn How to Ease Common Ailments Naturally” which describes how to grow, harvest, prepare and use 33 of the most common healing plants. It is written in an easy to understand style with plenty of pictures. Highly recommended. I have to admit, when I read the book's enthusiastic encouragement to use this herb or that, in this preparation or that, for anyone, adult or child – I was a little uneasy. I know herbs have been used for millennia, but I also know that the traditional medical community gets a bit shirty about self-doctoring; I also know children have very different needs and tolerances. But this isn't a casual hobbyist's manual – at least, it can be read that way, but it was not written so. It What a treasure. Loved this book! I've read it several times over the years and have tried several of her recipes. Fantastic beginners guide. Our favorite is the candula salve- we use it on a regular basis and it works very well. Her instructions on picking and drying the flowers and clear. Instructions for making salves is easy to follow. I also really enjoy the Chamomile tea for sleep. I have several of the herbs she recommends now growing in our yard and I look forward to finding more favorite uses from them. Loved this book! I've read it several times over the years and have tried several of her recipes. Fantastic beginners guide. Our favorite is the candula salve- we use it on a regular basis and it works very well. Her instructions on picking and drying the flowers and clear. Instructions for making salves is easy to follow. Enjoyed this book. Lots of god, basic information. It did cover a lot of what I already knew about general preparation (making infused oil, tinctures, salves, etc). The instructions were simple and will be a good reference. I loved the pictures of all the herbs. The visuals made me realize how common a lot of herbs are. I was able to recognize a few by sight, but never knew they had medicinal qualities. Love it! This was the first book on medicinal herbs I've read. It came highly recommended as a great beginner's book, and I can see why. Very simple explanations of the most common and useful herbs, beautiful pictures, and plenty of recipes with instructions on infusions, decoctions, tinctures, and salves all make this a must-have tome on a homesteader's book shelf. This is a lovely overview of some of the most readily available and helpful herbs. So many herbalists have Ridgid lists of how to prepare, what the herb is good for and how to cultivate. Gladstar recognizes that there is not a whole lot of consensus with these common herbs and honors their hardiness in cultivation. I love her attitude towards her plants and her garden. I only wish she had gone further into the energetics of the herbs. She only does this with a couple of them. This is an incredible book for the beginner herbalist! I loved the lay-out, how it wasn't overwhelming (only 33 herbs are featured) and Gladstar's own suggestions of favorite recipes and recommendations with each herb was infinitely helpful. This is definitely one to own and refer back to again and again. Fantastic book for beginners. The number of herbs discussed is limited, but I found it useful for a project about nervine herbs. I adore Rosemary Gladstar and all of her books, and the tone of her writing voice is warm, like sitting with a friend in a garden, sharing a cup of tea, and talking about staying healthy, feeling well, and living the good life. Really helpful + interesting introduction to the world of growing + utilizing medicinal herbs. Saved many recipes for future use. Would have given it 5 stars, if only there had been more photographs to aid this foraging newbie with identification. Wonderfully informative book written in inviting tone. Balance of content between overview of herbalism, details on herbs, and explanation of processes from harvest to tincture. A worthwhile read from an expert in the art, craft, and science of herbalism. I thought this was a great introduction to herbal medicine for a novice. Not too scientific, overwhelming, or pretentious but full of useful information. Rosemary's tone is lovely and inspiring, and there's a great assortment of plants to use and recipes to try. This book got me into natural living and made me realize how easy it is to make your own everyday life products! It's very inspiring and I frequently go back to this book for a read up on herbs and recipes. Very helpful and informative. I have tried many of her recipes for salves, tinctures and cold remedies. I am a big fan. For anyone wanting to get started in herbalism this is a great book to get started with. She really explains the uses and benefits of each plant. This is a great foray into the world of medicinal herbs. I borrowed this one from OverDrive and I certainly will be picking up my own copy to make notes in!! Very informative! This is my introduction to herbalism and I will definitely be referring to it in the future. i started an herb garden because of this book and it's been very helpful. I love this book. If you think using herbs for medicinal purposes is hard, it's the opposite, it's very easy. Start with the herbs that you need right now. For me it would be for indigestion, colds etc since it's winter here. I am looking forward to inspecting the weeds growing in my yard and hope to discover they are simply herbs that I can use for me and my family! Rosemary Gladstar is a pioneer in the herbal movement and has been called the 'godmother of American Herbalism'. She began over 35 years ago developing herbal formulas in her herb shop, Rosemary's Garden in Sonoma County, California. She is the founder of the California School of Herbal Studies, the oldest running herb school in the United States, author of The Science and Art of Herbalism home st Rosemary Gladstar is a pioneer in the herbal movement and has been called the 'godmother of American Herbalism'. She began over 35 years ago developing herbal formulas in her herb shop, Rosemary's Garden in Sonoma County, California. She is the founder of the California School of Herbal Studies, the oldest running herb school in the United States, author of The Science and Art of Herbalism home study course, and is the director of the International Herb Symposium and The New England Women's Herbal Conference held annually in NE. She is the author of numerous herb books including the best seller Herbal Healing for Women, The Storey Book Herbal Healing Series, Herbal Remedies for Vibrant Health, and the Science and Art of Herbalism, an extensive home study course. Rosemary is also the co-founder of Traditional Medicinal Tea Company and did all of the original formulations for the company. She has taught extensively throughout the United States and worldwide at venues as varied as backyard gardens, native villages, garden clubs to universities and hospitals. She has won numerous awards and certificates for her work with medicinal plants, but her greatest reward has been in watching the herbal renaissance soar from its birth and feeling in some small exciting way, a part of it.